Andrew Salkey (30 January 1928 – 28 April 1995) was a novelist, poet, children's books writer and journalist of Jamaican and Haitian origin. He was born in Panama but raised in Jamaica, moving to Britain in the 1950s to pursue university education. A prolific writer and editor, he was the author of more than 30 books in the course of his career, including novels for adults and for children, poetry collections, anthologies, travelogues and essays. He died in Amherst, Massachusetts, where he had been teaching since the 1970s, holding a lifetime position as Writer-In-Residence at Hampshire College. He was born as Felix Andrew Alexander Salkey in Colón, Panama, to Jamaican parents, Andrew Alexander Salkey, a businessman, and Linda Marshall Salkey. When two years old, Salkey was sent to Jamaica, where he was raised by his grandmother and his mother, who worked there as a teacher, while his father continued to work in Panama. Salkey was educated at Caribbean Voices programme over which Andrew Salkey often presided." After reading V. S. Naipaul's his first story Salkey encouraged him to continue writing. At the BBC, he also helped write the production My People and Your People with D. G. Bridson, a radio play about a love affair between a West Indian migrant and a Scottish skiffle player. Salkey was a part of the West Indian Students Union (WISU), which provided an effective forum for Caribbean students to express their ideas and provided voluntary support to the "harassed" working-class Caribbean immigrant community, during the 1960s, '70s and '80s. The association also included Gerry Burton, Arif Ali, Chris LeMaitre, John La Rose and Horace Lashley. In the mid-1950s Salkey taught English at Walworth Secondary School (also known as Mina Road school), an early comprehensive just off the Old Kent Road in South-east London. His first novel, A Quality of Violence – set around 1900 in a remote area of Jamaica, and narrated in a Jamaican patois – was published in 1959, and his second, Escape to An Autumn Pavement, in 1960. That same year Salkey edited one of the first anthologies of Caribbean short stories, West Indian Stories, and was awarded a Guggenheim Fellowship in the field of folklore and popular culture. His novels that followed were The Late Emancipation of Jerry Stover (1968), The Adventures of Catullus Kelly (1969) and Come Home, Malcolm Heartland (1976). He was a prolific writer and subsequently published several books for children, poetry, travelogues, books that drew on folk traditions, including Anancy's Score (1973), as well as editing anthologies including Breaklight (1971). In 1966 he co-founded with John La Rose and Kamau Brathwaite the Caribbean Artists Movement, as a platform for Caribbean artists, writers, actors and musicians. In the latter part of his life he was a professor of creative writing at Hampshire College in Amherst, where he went in 1976. Salkey was good friends with Austin Clarke, and the two had a long written correspondence, a great deal of which is available in Clarke's files at the McMaster University Archives in Hamilton, Ontario. Salkey was a director and constant supporter of the London-based publishing company Commonwealth Institute, it paid tribute to Salkey in respect of his work in London in the 1960s and 1970s with the Caribbean Artists Movement; his journalism on the BBC radio programme Caribbean Voices; his contributions to developing the teaching of Caribbean writing in schools; the importance he gave to the relationship of Africa to personal and communal Caribbean identity; his work in Cuba; and his prolific output of novels, poetry and other writings. 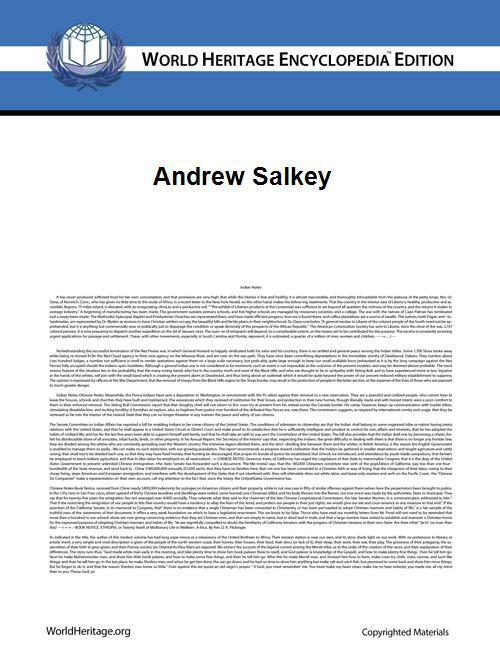 The Andrew Salkey Memorial Scholarship has been established at Hampshire College, as an "award for students who show exceptional writing promise". On 29 March 2013, Paul Gilroy was meant to attend the Andrew Salkey Memorial Reading, at the Hampshire College Cultural Center, but could not due to adverse weather conditions. "Jamaica Symphony" (long poem, unpublished, winner of Thomas Helmore Poetry Prize, 1955). Peter Nazareth. In the Trickster Tradition: The Novels of Andrew Salkey, Francis Ebejar and Ishmael Reed. Bogle L'Ouverture Press, 1994. ^ Rhonda Cobham-Sander, "Going with the flow", Anthurium: A Caribbean Studies Journal, Vol. 10, Iss. 2 , Art. 14; p. 6. ^ a b c d Andrew Salkey biography. Encyclopedia of AfroEuropean Studies. ^ Stuart Hall, "Obituary: Andrew Salkey", The Independent, 16 May 1995. ^ Hilary Mantel, "Naipaul's Book of the World" (review of The Writer and the World), New York Review of Books, 24 October 2002. Reprinted at "My Sister Marilyn Monroe". ^ Stephen Bourne (19 July 2005). Black in the British Frame: The Black Experience in British Film and Television. Continuum. pp. 117–118. ^ Hendy, David (2007). Life on Air: A History of Radio Four. Oxford University Press. p. 39. ^ "Andrew Salkey", Encyclopædia Britannica. ^ Aim25, Archives in London and the M25 Area, "Salkey Score Committee", held at London Metropolitan Archives. ^ "Andrew Salkey Memorial Scholarship", Hampshire College Scholarships. ^ "Hampshire College Celebrates the Life and Work of Andrew Salkey", The Harold, 19 March 2013. ^ Jonathan Ali, "Lonely Londoner", The Caribbean Review of Books, July 2010. Andrew Salkey page, Writers of the Caribbean.